Then Why Call Bangladesh a Democracy? When you hear Bangladesh in the international media what image pops up in your mind? Just another idiosyncratic South Asian democracy? Or a country of authoritarian rule? If you never thought that Bangladesh is not a democracy that is not your fault. In a global media where sweeping generalizations are ordinary, you might not notice that something fundamentally has changed in Bangladesh. From the everyday extrajudicial killings of opposition political activists to detaining opposition editors to shutting down opposition TV stations! 28 April was the big day for Bangladesh. After three months of street protests and widespread violence from government and opposition, there were civic election in the three biggest municipalities. The Asian Human Rights Commission (AHRC) has said ‘rigging and ballot box stuffing by ruling party cadres, polling officers and law-enforcement agencies’ marked the civic polls at Dhaka and Chittagong city. The opposition candidates thereby boycotted the city elections. 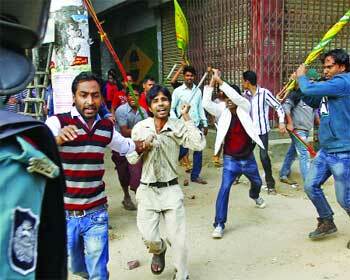 But this is not new to Bangladesh, even considering its recent history. You don’t need to be a political scientist to understand that there are some inviolable characteristics absolutely essential in order for a country to operate as a democracy. According to basic outlines of politics 101 or even a dictionary – democracy necessitates a representative government elected through a free and fair election. Bangladesh is not a democracy. It has been such, since 5 January 2014, after a one-sided election which was boycotted by pretty much everyone except the governing party itself. Even that election was marred by widespread stuffing of ballots, which will remind international observers of the elections under Hosni Mubarak or Bashar Assad. The opposition didn’t participate in that election because it didn’t want to give it a stamp of credibility? Ensuring a free and fair election necessitates the rule-of-law, equality before the law, civil space and liberty, a free press, and the preservation of fundamental human rights. It is really difficult to expect rule-of-law from law enforcing agencies which are reported to have killed more than 143 people through systematic extrajudicial killing in just first three months of this year. Human Rights Watch in its global report 2015 said, the Bangladesh government failed to prosecute security forces for serious abuses including killings, disappearances, and arbitrary arrests. Now, a procedure is under consideration which will give immunity to security forces for killing political activists. Amnesty International has urged Bangladesh government to reject this outright. Many opposition activists, before getting the chance to defend themselves in a court of law, are being killed in ‘gunfights’, ‘truck accidents’ or ‘crossfires’. So, there is no rule-of-law for them; however for few others the law is beyond equal. In other words there is a selective rule-of-law system. The state of press freedom is also going through the most repressive time, only second to the tenure of the first Awami League government of 1972-75. Under the current regime, three opposition TV channels were shutdown and two opposition newspapers were closed. An investigative report by Al-Jazeera has revealed that journalists and media houses are operating under fear, constant watch and censorship by the Government. In May 2013, following a massacre on protesters in Dhaka’s Motijheel business district, police took control of the studios of Diganta TV and Islamic TV, forcing the channels to shutdown for airing the live footage of the mayhem. A broadcast policy has been devised that prohibits content that may tarnish the image of the regime; making it mandatory to broadcast programs the regime deems to have national importance (like speeches of government leaders). Does Bangladesh still sound like an authoritarian country? One top opposition editor is behind the bars indefinitely on allegations of contempt and inciting religious sentiment. Another opposition TV chief was sent to jail for broadcasting a speech of the opposition leader Khaleda Zia’s son. Shutting down popular talk-shows is also a regular phenomenon. In the political space, the main opposition party Bangladesh Nationalist Party’s (BNP’s) chief was barred by sand-trucks from moving out of her office during major programs for a lengthy period of time. It was in effect an “Aung San Suu Kyi style” house arrest, except without calling it an arrest. The offices of the opposition party are beefed up with huge police presence. The spokesperson of BNP is ‘missing’. Opposition parties and rights organization have alleged that the white clothed security forces have abducted him. Another opposition alliance Jamaat-e-Islami’s party office is closed since 2011. Thousands of opposition activists including women are in jail, and facing all forms of repression. Given the above brief, let us revisit the original question: why call Bangladesh a democracy anymore? In global politics there are some redlines. Until and unless those redlines are crossed the dominant media narrative is not changed. What would be that redline in case of Bangladesh? An eminent arrest of the opposition chief or a massacre involving a larger quantity of opposition protesters? Apparently the sexiest way to make headlines is to let the world know that Bangladesh, by any definition – classic or contemporary, is no more a democracy. The writer is a doctoral student in the Department of Political Science at Texas Tech University, USA.